It was not just warm but humid and lukewarm day, perfect setting for the day of Halloween. How was your Halloween, everyone? We came to our favorite place, Tuttoriso, and jammed a bit. Our good friend, Eiji, helped us grooving on good notes. By the way, on the way home, there was a pack of people going to Halloween parade and I literally saw all kinds of people (and non-people), from the men from the galaxy far far away to the bearer of my precious to the cursed pirates from the Caribbean. I think I saw every character of Disney, 10 Spider-Men and his villains, Snow White, Dorothy from the Wizard of Oz, Marvel superheroes, and other characters which I could not really identify. Oh yes, to which I might add, I could not take my eyes off of those young ladies who should have been more warmly attired. That was a fun and special night. Maybe I should put on some costume next year. Well, that's a big maybe. Staten Island, New York is our foothold, We just participated in the Staten Island Jazz Festival for the first time. Well, it was very first time for us to perform at any kind of jazz festival, period. That was our big challenge. Our music has a fragrance of jazz but not that much. We were not sure how the jazz funs were going to respond to our music. After our performance, the kind audiences gave us a round of applause. That answered our question. It was a very fruitful concert for WaFoo. Takeshi was in fast asleep at the green room. Well, we performers quite often have to wait for a long time at any kind of festivals. I actually have another close-up photo of him which is 200 times funnier but I won't put it in here. I have mercy on him. That's the way of samurai. The green room was at the downstairs of the church right on the back of the music hall. The room was a bit chilly because the performers were going in and out all the time, and each time they open the door, the cold air came into the room. Yuuki, but weren't you exaggerating a little bit. You were turning a Marshmallow Man. After the festival, we went to all-you-can-eat sushi in Brooklyn and literary did all- we-can-eat. This is the part we enjoy the most. We played at the organic restaurant where we usually play every week before the festival. I brought a riq, the Middle-Eastern tambourine, and an ukulele which I borrowed from my friend Kelly. I use a tambourine a lot in this band so riq fit right in, and the uke also add interesting atmosphere to WaFoo. We do not have a guitarist in the band so this kind of strumming instrument fill in the missing area of our music. 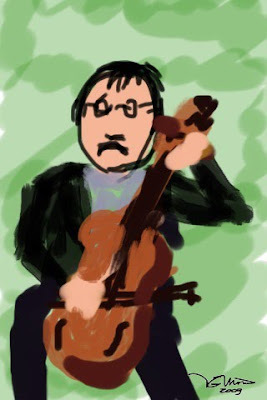 We were chatting with the audience after the concert at the church on the last Saturday and a gentleman came up to us with his iPhone and said, "Hey, I drew you guys on my iPhone." Then he showed us a couple of drawings on the tiny screen of his iPhone. 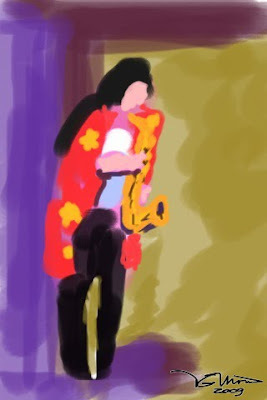 Mr. Tim Moran, the professional artist, drew the pics of two of the members, Yuuki & me, in such a short period of time using the application called "Brushes" on iPhone. Wow, they are amazing pics! He drew them while we were performing. About half a year ago, the cover of The New Yorker magazine was drawn the same way and that was the hot topic back then. (Here is the article. There is an interesting movie how it was drawn on that page). Well, I could not believe if anybody could really draw a picture on the tiny screen of iPhone just using fingers until I saw the actual drawings on THE tiny screen with my own eyes. They are energetic pics. I can almost hear the groove coming out from these drawings. Tim said that he would come to our show again and draw the rest of the members. Tim, Thank you very very much for such a wonderful gift. We are looking forward to seeing you again in our future concert. Tamara, Kazuo, Yuuki and I have fought side by side in Richmond County Orchestra for several years. Kazuo and Tamara had this special idea for the longest time. Maybe we can join forces and we can both profit from it. Kazuo's Japanese project, "WaFoo" & Tamara's classical trio, "Musical Chairs Chamber Ensemble (MCCE)" came together and performed. Sometimes, the process of merging two different genres of music ends up in a complete train wreck, or one side is totally disappeared and sucked into the other side. Either way it's painful. How can we combine two of quite different types of music beautifully (without catastrophe)? One is classical, the other is Japanese-influenced rock/pop/jazz/funk/fusion etc. Seems like we have nothing in common, but surprisingly this unusual combination landed us in the whole new world with the view of the paths to a virgin soil. The audience at the concert liked us, and, more than anything, we loved ourselves playing together. I have a good feeling that this concert is the first episode of the long interesting and exciting series of creating the new genre of music. We are going to get ready for the second episode. Tamara, Keats and Clarice, we really enjoyed playing with you guys. Thank you very very much for the great concert. We did another gig at Tuttoriso the organic restaurant right after the concert at the library. We are working so hard in here while Yutaka the drummer is somewhere in Europe enjoying the life and maybe drinking a cocktail or something at a resort. Yutaka the drummer scored a tour from another band and had flown away and disappeared to the East sky, so we are going to play with just four of us for next one month. It was the concert at the Richmondtown Library in Staten Island, New York. Nobody knows why but every time we play at this library, the weather is always either big rain storm or big snow storm. It was raining so hard as we expected but so many people showed up for the concert. Thank you to all of you!